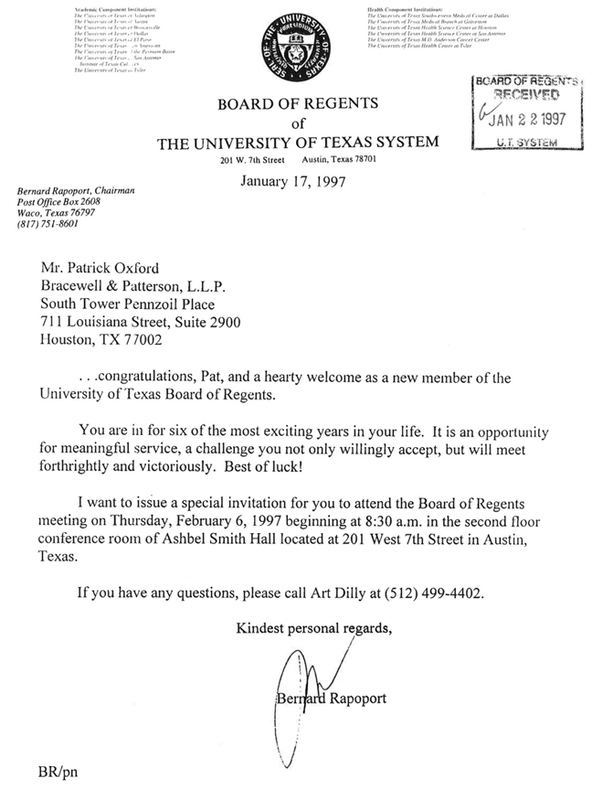 PATRICK C. OXFORD, a Houston attorney and business leader, was appointed to a six-year term on the Board of Regents of The University of Texas System by then Governor George W. Bush, effective February 1, 1997. He currently serves as Chairman of the Health Affairs Committee and is on the Academic Affairs Committee and Finance and Planning Committee. Mr. Oxford is Managing Partner of the law firm of Bracewell & Patterson, which he joined in 1967. Mr. Oxford was born in Beaumont. He earned two degrees from U. T. Austin, a B.B.A. with honors in 1966 and a J.D. with honors in 1967. He was managing editor of the Texas Law Review from 1966 to 1967 and was selected for membership in The Friar Society, the University's oldest and highest honor society. He is a former member of the board of directors of the U. T. Law School Alumni Association and has served on various committees of the U. T. Austin Ex-Students' Association. The Association named him an Outstanding Young Texas Ex in 1981. Throughout his career, Mr. Oxford has been active in Houston's business community. He has been active in Texas public policy issues since 1977, serving as chairman of several Statewide election campaigns and on other committees on public policy since that time. Mr. Oxford and his wife, Katie, have two daughters.